Once you have a handful of names on your tree, you can begin research on them to find even more roots, branches and leaves. The Internet is a wonderful genealogical tool, providing resources to help you find censuses, obituaries and other records to uncover your family history. 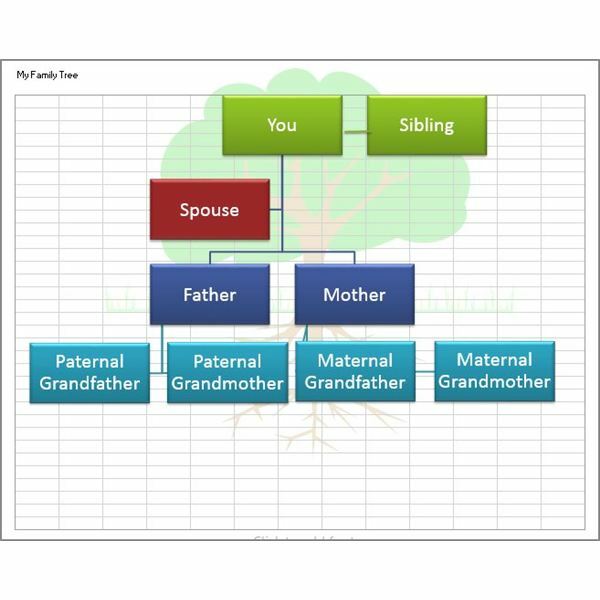 Whether you have a school project or aim to become your family’s genealogist, one or all of the following family tree templates may help you begin organizing the information you already have and collecting new data as your search progresses. Note: When you click on the download links below, no preview will be available because the items are template files. In order to see them, you will need to download the files (click the downward facing arrow or use the keyboard shortcut Ctrl-S) and open them in the application they were created in. The first template is a SmartArt family tree in an Excel worksheet. The template includes a tree graphic in the header that you might not see while working on the chart but you can view in Print Preview or when you print the worksheet. If you want to modify or remove the image or the page title, select the Insert tab, click Header & Footer and make any changes you desire. The primary person is listed near the top of the tree with a shape for a sibling to the right and the person’s parents and grandparents listed below. You can add more shapes, such as children, aunts and uncles or more grandparents by clicking on the shape to which you want to connect more people and selecting the Design tab under SmartArt Tools. Click the Add Shape dropdown and choose where you want to add a new shape, such as Above or After. You can change the colors and appearance of the tree, as well, choosing options from Change Colors or SmartArt Styles. To change the color options, select the Page Layout tab, click the Colors dropdown in the Themes group and select a different color theme. Also making use of a SmartArt chart, this template enables you to make a family tree that includes photos of each family member. The primary person is near the top of the chart with a shape for his or her spouse to the right and a shape for a child directly above them both. To add a family member’s name to the tree, double-click the sample text and type over it. To add a photo, click on the picture placeholder in the center of the shape associated with that person. The Insert Picture dialog opens, so you can navigate to the image you want to use. Should you want to use this template but not add photos, you can change the chart style. Click anywhere inside the family tree area to activate the SmartArt Tools tab and click on the Design tab. Click the Layouts dropdown and choose another design that doesn’t include picture placeholders. 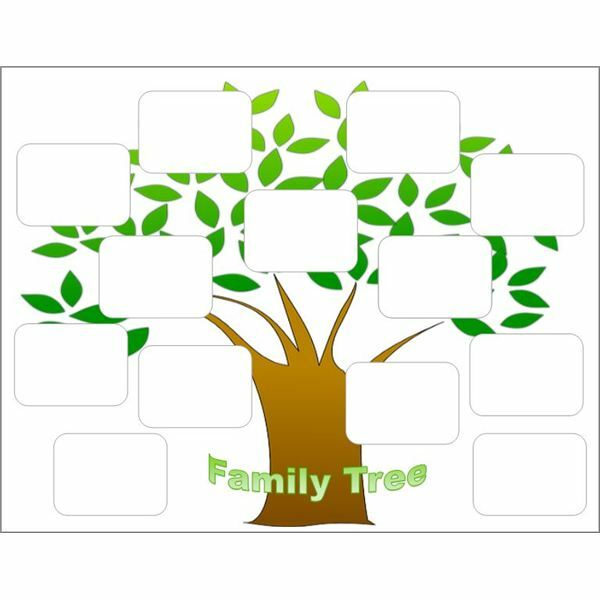 If you want to make a family tree for a class project or to hang in your home, you might prefer this template. A full, leafy tree provides the backdrop of this publication and plain white rounded rectangles are placed evenly across the tree with a single box near the center for the maker of the tree. To add names and details, such as birthdates and relationships to the primary person, right-click a box and choose Add Text. If you need additional shapes, you can click on any one shape, press the Ctrl key and drag a new shape to the position you choose. You can make changes to all the shapes at once if you need to, as well, such as resizing or adding a fill color. To do so, press and hold the Ctrl key while clicking on each shape. Once they are all selected, any changes you make are applied to all of the shapes at the same time. Is there a type of family tree template not included here that you’d like to see?